You are here: Home / Articles / Are the Swans overachieving or underachieving? Are the Swans overachieving or underachieving? This is the Swans’ seventh consecutive season in the Premier League. It is a time when they should have consolidated and when they should be looking down on those teams who have had less time in the league and less money to play with. It is a time when they should have a squad of premiership battle-hardened warriors who are used to the pace, skill and vigour of the toughest league in the world. Is that the case, though? Just how is the league made up, and where is our place in it? And are we punching above our weight or falling below expectations? A quick look at the Premier League table would suggest it is certainly the latter of the two, but it is not that simple. It is increasingly hard to segment the teams in the league, because the issue of money, as well as the backing the manager has, distort the traditional and simpler view of who should be doing what. And, of course — football being football — there are always going to be occasions like Leicester winning the title while Chelsea “languishes” in 10th. To see where Swansea should be, let’s try to break down the twenty teams in the league. We can discount the so called “big six”. After that, there is very little to differentiate the rest of the teams on paper. Southampton and Everton would normally consider themselves closer to knocking on the door of the top six than standing on the trapdoor to the Championship; but Southampton have been going backwards in recent years, and this season — when Everton were supposed to make strides into the very top echelons of the league — has seen The Toffees fall apart dramatically. Amazingly, Stoke – which is one of the most established sides in the league – have also been flirting with relegation fights of late, and West Brom, the original yo-yo team, are once again looking like they might be attempting to revert to type. In other words, there are at least ten sides in the league that are all in exactly the same position in terms of ambition and expectation. So why are Swansea favourites to go down, according to the bookies? The newly-promoted teams, especially Newcastle and Huddersfield, are overachieving tremendously. Brighton have also picked up. We all know that this could very well be temporary, but points on the board are crucial. There is still the perception that Everton, West Ham, and even Palace are in false positions and will get themselves out of trouble. West Brom have got Pullis, who has been there, done that — even though that includes losing the faith and support of much of the Hawthorns faithful. Then there is Leicester, who have a number of albeit dwindling world class players. Burnley seem to be the new Everton, which leaves Bournemouth. Like Swansea, they should have the money and experience to push on, but are finding it increasingly hard to simply tread water. The lack of world beaters is potentially the reason why Swansea are struggling and are predicted to continue doing so. While several have been quietly going about their business, only Abraham has shown that he has what it takes to win games and drag draws back from defeats. 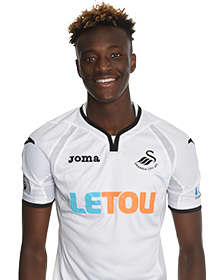 The Chelsea loanee, with his 4 goals and 1 assist so far, has been directly responsible for 71% of the Swans’ goals this season. That is a frightening and damning statistic. In the ground, pubs and especially on the back pages, there is the feeling that whereas other teams should, and most probably will, have an upturn in form, Swansea are where they are for a very good reason. And that reason is simply that they have become a bottom-four, or probably bottom-three, team. The news of Claude Makelele’s departure is only going to add to the feeling of inevitability. Of course his replacement is none other than Swansea City legend Leon Britton, but only time will tell if the former captain can help guide the Swans in the right direction. 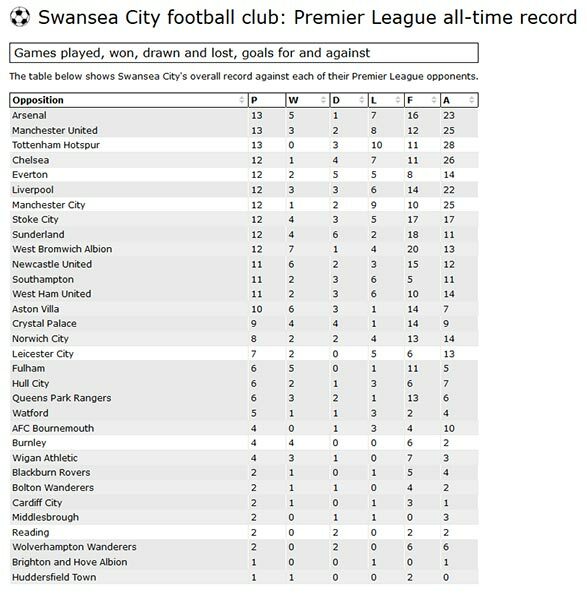 So, to answer the original question of whether Swansea are over- or under-achieving, the sad truth is that, at this stage, they are doing neither. They are where they deserve to and arguably should be at this moment in time. The length of a club’s tenure in the league just doesn’t have the automatic benefits that it used to. It is not the case that a club has to crumble for them to lose their hallowed premiership status. All you need to do is become even slightly less competitive than the dozen other teams at your level and you end up right back playing against the likes of Ipswich, Birmingham and — dare I say it — Cardiff again. * Premier League playing record data kindly provided by the 11v11.com website.